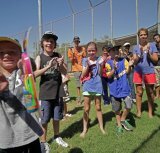 The Inclusive School Holiday Program celebrates two years of community building in Karratha this July. 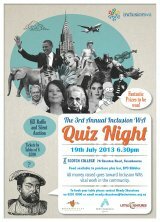 Our Quiz Night has sold out! Thanks to all that have booked tables and thanks to all that are supporting us this year. For more info on the evening, including our fantastic silent auction prizes, read on. 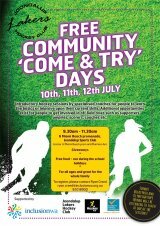 During the July school holidays the Joondalup Lakers Hockey Club will be running an inclusive hockey program. Why is this noteworthy? Well for those of us focused on developing people and the community by supporting inclusive practices we think about the types of programs being run by the Lakers quite a lot. Inclusion WA together with the Commissioner for Children and Young People are hosting a consultation for young people with a disability, to give them the opportunity to speak out about their views, concerns and hopes for the future. Inclusion WA is thrilled to have been chosen as a finalist in this year’s Constable Care Child Safety Awards. This is Ryan Creed, he joined us in April as a Sport and Community Development Officer and is a sports nut. Ryan loves surfing, cycling, weight training and pretty much any competitive sport! He is also (somewhat tragically) a North Melbourne supporter. But we still like him! Ryan (also known as Clearwater Revival) is passionate about working with sporting clubs to achieve great results in the community if you are part of a sporting club make sure you get in touch! Swimming Australia and the University of the Sunshine Coast are conducting a survey which is aimed at understanding the lifestyles of people with a disability in Australia, and their interest in swimming as a physical activity. Your response would be greatly appreciated. Participation in this questionnaire is highly valued whether you are a regular participant or non-participant in aquatic activity. They are interested in the barriers to participation and the reasons for non-participation that people with a disability face. Please also feel free to pass onto people with a disability associated with your organisation who are aged over 14 years. You're receiving this newsletter because you signed up for the Inclusion WA Newsletter - Inclusion Insight.